Why Is Annie Leibovitz Broke? When Annie Leibovitz essentially pawned her life's work in exchange for $15.5 million from Art Capital Group, the Times noted of such deals, "This little-known corner of the art business is lightly regulated and highly litigious." Now she's being sued. Leibovitz is a famed photographer who shoots for titles like Vogue and Vanity Fair — her staff contract with the latter is rumored to net her a cool $2 million per year — and does commercial freelance work for corporations like Disney and luxury behemoths like Louis Vuitton. Her financial difficulties are not news; Leibovitz first approached Art Capital for a $5 million loan last fall, and borrowed another $10.5 million in December. Art Capital typically charges 6-16% interest; a $5 million principal carried at 6% compound interest for two months, plus an additional $10.5 million loan, also at 6% interest, compounded through this month, would equal just over $24 million, which is in fact the sum that Art Capital filed suit for Wednesday in New York's supreme court. As collateral, Leibovitz offered the titles to her three Greenwich Village townhouses, and her home in upstate New York — and the rights to her entire archive of work. But why would such a famous artist — and one of the most commercially successful photographers the world has ever known — need to pawn the rights to every photograph she has ever taken or will ever take until the loans are repaid? When news of Leibovitz's financial difficulties first surfaced, there was speculation that the photographer was left cash-strapped when she inherited property from her longtime partner, Susan Sontag, in 2004; as an unmarried gay couple, Leibovitz would have been required to pay a steep 45% tax on any inheritance. But it turns out that Sontag and Leibovitz were no longer together by the time of Sontag's death; the essayist bequeathed the bulk of her estate to her son, David Rieff, and in her will left Leibovitz only a maximum of four "articles of my tangible personal property." So, issues of blatant unfairness in the federal inheritance laws aside, it wasn't the "gay tax" that cost Leibovitz millions. Is Annie Leibovitz Being Forced To Pay A "Gay Tax"? A more likely culprit is the costly renovations to Leibovitz's two townhouses; in 2002, workers for the photographer damaged the foundations of a third, adjoining house, forcing the family who owned it to evacuate their home. (They eventually settled for an undisclosed sum with Leibovitz, after filing a $15 million lawsuit; the terms of the settlement included Leibovitz buying the crippled house.) At the time, neighborhood preservationists whispered that the photographer had intentionally undermined the foundations of the protected houses, which all date from the 1830s, in order to get the go-ahead to perform renovations that would otherwise have been considered too drastic by the Landmarks Preservation Commission, a strategy known as "demolition by neglect." Seven years later, the townhouses are finally repaired — but at who knows what cost. Now, Art Capital Group is demanding Leibovitz allow real estate agents access to her Greenwich Village properties so they can assess them for sale; the lender's suit against Leibovitz accuses her of "boldly deceptive conduct" and the failure to make any attempt to come up with hundreds of thousands of dollars worth of scheduled repayments. Although at the time she took out the loans, Leibovitz agreed to the idea of selling her physical and intellectual property in order to make repayments, since taking the money, Art Capital Group alleges, she has refused to comply with her creditor's attempts to take what she signed over. It seems unlikely that a woman who last year couldn't come up with $400,000 to pay a freelance stylist, and $200,000 to pay for her photographic equipment, would be able to survive a $24 million judgment against her without being bankrupted. Even those triplet townhouses can't be worth much in Manhattan's present real estate market. If Leibovitz went into this agreement expecting leniency from a company which decorates its New York offices with the masterpieces forfeited by other defaulting debtors, she has been sadly proven wrong. 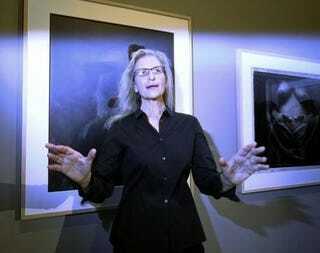 Is Annie Leibovitz Being Forced To Pay A Gay Tax? Will Annie Leibovitz Be Forced Into Bankruptcy?